Today is a dark day for car enthusiasts around the world. It seems yet another Ferrari has burned itself to the ground, and this time, it’s an F40. Not good. 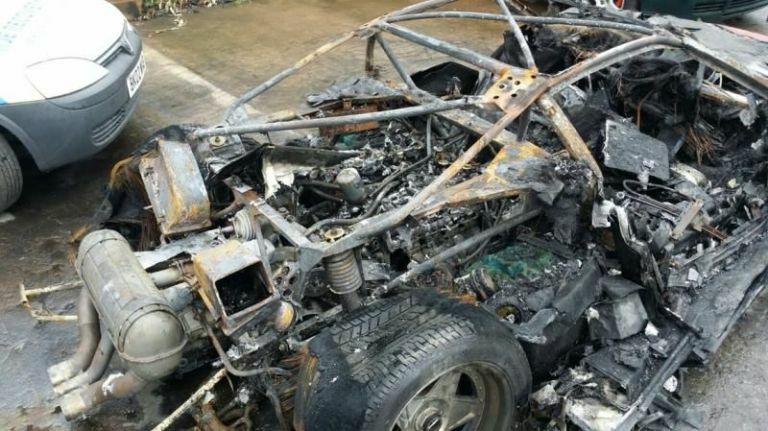 Yesterday evening, user Paul5000 posted a few pictures of what seem to be a completely charred Ferrari F40 to the ultra-exclusive car section of the Ferrari Chat forums. The poster claims the car had just undergone a full restoration, and was being taken out on it’s maiden drive. As we can see from this picture, it’s apparent the fire started somewhere in the engine bay, and spread to engulf most of the body. It looks as if nothing’s salvageable, which is a real shame. Ferraris are well known for lighting themselves on fire, which makes this unfortunate event pretty unsurprising. It’s up to the mechanics and drivers to make sure there’s fire-suppression devices in and around the car, especially when testing a newly restored example such as this. Now there’s just one less Ferrari F40 in the world. Depressing. 5.0 V8 Mid-Engined Mk1 Ford Transit Van – The Best Van Ever!